It's everything but the turkey this year as far as Chef Pierre MC of Croisette Cafe is concerned. Like the proverbial magician, the French chef has pulled out notable options from his oven: capon, pork loin, Aussie beef striploin and lamb leg in place of the big bird. There's also a set festive Christmas menu (RM118 per person) available for dine-in or takeaway (nicely packed in a convenient bento-type box) in the week leading to Christmas. The set menu commences with a glass of red sangria with pear dices, to get diners into the proper celebratory spirit. Petite amuse bouche: quiche lorraine bites (with real bacon!) and crisp toast squares topped with olive caviar tapenade & semi dried tomato - aptly whet the appetite for other dishes to come. 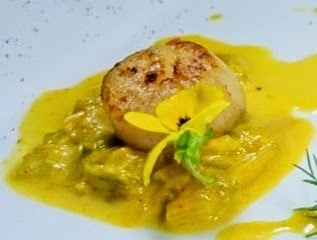 Chef's signature pan-fried scallops on a spicy leek fondue nest will be the curtain-raiser. The subtle heartwarming sweetness of the scallops is lush on the palate, emboldened by the creamy wilted leek. For your main course, you can select either roasted pork loin on a bed of young veges, wholegrain mustard and sage sauce, potato paysanne and mesclun salad; braised duck breast with raspberry sauce or seabass with sauce duglere, celeriac puree and vegetable tian (sliced grilled vegetable layered on top of one another). A rousing Christmas platter of assorted fruit tartlets, vanilla mille feuilles, mini opera with Earl Grey cream and raspberry coulis brings the indulgent feast to sweet closure. Family feasts and home parties are made hassle-free by the Croisette Cafe team as they're offering festive roasts for dine-in as well as takeaways this year. 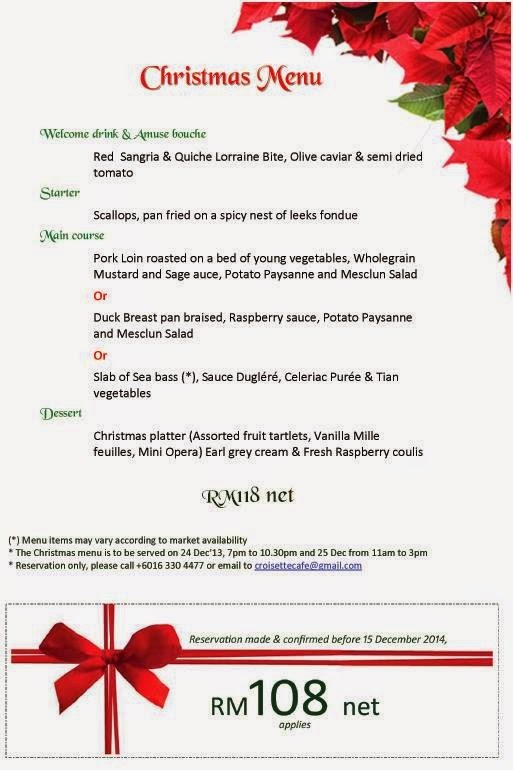 Just give the chef advance notice and you can be the perfect host this Christmas. Our top pick is the Aussie beef striploin (RM210/kg), best served medium rare. The mildly gamey roast Aussie lamb leg (RM160/kg) weighing in at about 2.5-3kg is ample for a party of 6-10 persons. Not into red meat? Then consider a 3kg capon (castrated male chook, RM95/kg) roasted whole as the alternative. The slightly muscly meat has a nice resistant springiness to it and tasty juiciness to it, the more you chew on it. You can complement these roasts with Caesar Salad with streaky bacon (or smoked salmon) at RM25/kg (yields 5-6 portions), Ratatouille (Mediterranean medley) at RM35/kg and Roast Potato (RM35/kg). All the roasts are served with thick meat jus gravy except for the lamb which comes with pistou (sweet basil, garlic, rock salt and olive oil) flavoured with peppercorns. Also available are pretty beribboned mason jars of country-style pork liver pate (RM48/kg) and prawn bisque with rouille and croutons (RM35/500g jar; 2 servings). House dessert such as Bavarois Mango/Raspberry, Trio Choc Cake and Passion Indulgence Cake are also available at RM28/half kg. Croisette Villa & Cafe Penang: 546E, Medan Tanjung Bungah, Tanjung Bungah, Penang. Please call 016-330 4477 for reservations.